Safety and recreational improvements were recently completed on a low head dam on the Fox River. The improvements included downstream steps, a fish ladder, and a bypass channel at the Glen D. Palmer Dam in Yorkville, Illinois. Are these life safety and recreational features that could be added to the Kankakee River dam in Kankakee and Wilmington, Illinois? The steps were constructed to eliminate the dangerous hydraulic jump on the downstream end of the spillway. 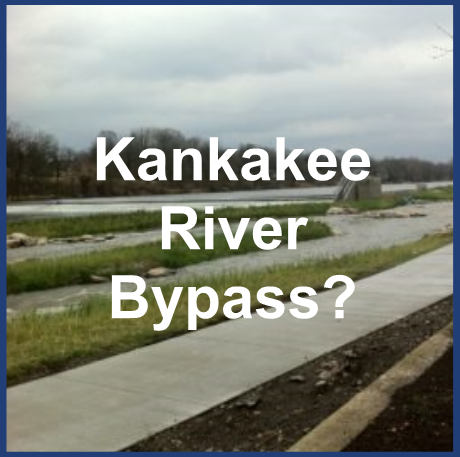 This is the condition you often see on the Kankakee River in Kankakee, Illinois on the downstream side of the dam. The hydraulic “jump” is where the water surface actually slopes back to the dam for a short distance. The jump creates a large trough where floating objects bobble and role until escaping down stream. The steps constructed on the dam on the Fox River in Yorkville allow river flows to cascade downstream eliminating the hydraulic jump or large trough on the downstream side for normal flow conditions. The impact of these steps are dramatic. Drive by the Kankakee River dam in Kankakee sometime and compare the view pictured below. I will leave it to you anglers to watch the slide show to learn more details about the fish ladder design and construction. The fish ladder is a narrow concrete channel found on the north side of the dam. This structure allows fish to migrate upstream. Is this something that would be a benefit to anglers in our area? Paddling Around the Kankakee River Dam? Paddlers can now run a 1/4 mile or so long “stream” with rapids and pools and drops around the dam on the Fox River in Yorkville, Illinois. 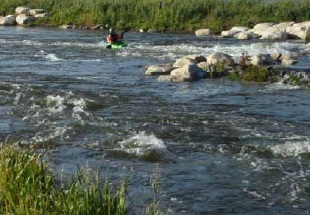 The bypass channel – stream is a huge success and is enjoyed by novice and expert paddlers. There is a linear park following the bypass channel with benches and standing areas to watch action on the water. How exciting would it be to see people “shooting the rapids” in downtown Kankakee on a hot summer day? Or dropping a kayak in at Cobb Park and paddling to Bird Park?